Samsung is on a good run with phones at the moment and this is all down to the Android-toting Galaxy S.
The company will be hoping this form continues with its latest handset which has sneaked on to the web. It's packing Windows Phone 7, and it has been named Cetus. Unless you are no au fait with the stars, Cetus is a constellation in the sky. It's also a Greek sea monster, but given that Samsung has some weird obsession with space we think it's named after the former. The handset has a 4-inch OLED screen, 5MP camera, front facing camera, GPS, Bluetooth and all the other gubbins you have come to expect from a smartphone. There's not much word on what else we are to expect on the phone – other that it will probably be given the SGH-i917 tag in America. 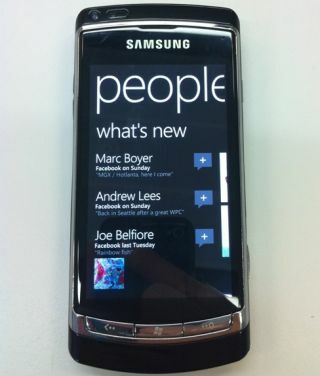 And as this is a leak, there is no UK release date or pricing available for the Samsung Cetus.